Save time and money with DIY single serve reusable coffee filters. Simply pop the reusable filter into your single-serve brewer and add coffee, cocoa or tea leaves for money-saving convenience. Compatible with most Keurig models (except Keurig 2.0). Set of 3; each 2" dia. x 1 3/4" H. Includes BONUS coffee scoop. Dishwasher safe stainless mesh and BPA-free plastic. I chose this item because I am constantly buying more and more pods and it cost so much to continue to do that, this way I can still enjoy my coffee and save money at the same time. The k-cups are expensive and this will save us on the price of coffee. We bought th Keurig Coffe maker, but we still have a 3# can of Folgers coffee. This will help to use it up. to use with my kuerig brewer for my own chocolate or coffee. I need the product and hopefully they fit my machine. It is a great value! To save money. The pre-prepared coffee packs are costly. saves you money from buying all those expensive pods. compatable with keurig 2.0 ? BEST ANSWER: I have the Keurig single serve 1.0 and it is compatible. These reusable coffee filters sure save me much hard earned money. 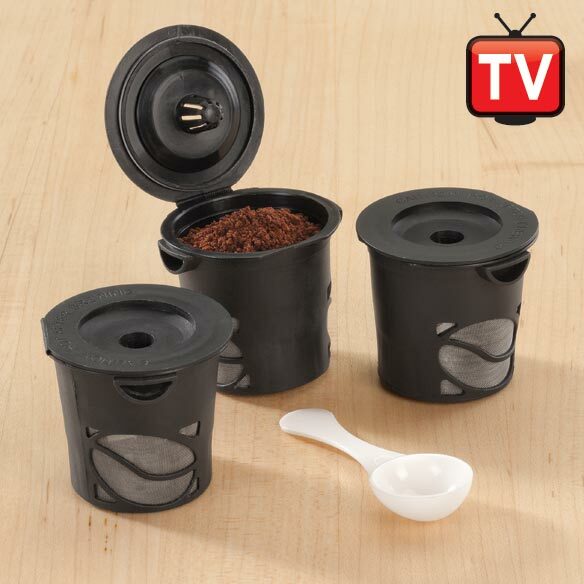 Are these refillable pods compatible with "Hamilton Beach Flex Brew" ? BEST ANSWER: Thank you for your question. The pods measure 2" dia. x 1 3/4" H. You will need to measure the ones you use now. We hope this information will be of help to you. It says compatible with most Keurig models "Except Keurig 2.0" . I need one that will work in 2.0--will this work ? BEST ANSWER: Thank you for your question. These filters do not work for the Keurig 2.0. We hope this information will be of help to you. Do they fit directly in the machine or do you need to use the Keurig attachment for reusable filter? BEST ANSWER: Thank you for your question. No they would not need a attachment they will fit. We hope this information will be of help to you. Is compatible with Keurig k10 mini plus brewing system?